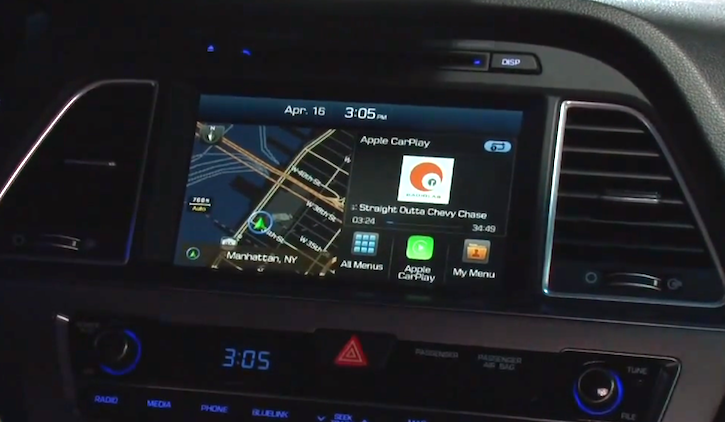 CNET has posted a hands-on video with the 2015 Hyundai Sonata and Apple CarPlay from the ongoing New York International Auto Show. Hyundai's upcoming car will be available sometime this summer, equipped with CarPlay capability. All comments will be screened for spam. Allow up to 24 hours for comments to show up. *Prices change often. Sales tax & shipping may be extra. Click affiliate links for latest price. Items may be sold by third-party sellers. Pioneer AppRadio 3 (SPH-DA210) Review: Some Things Old, Some Things New! Nearly 5 Months Later, My AppRadio 4 Anti-Glare Screen Protector Still Rocks! PIONEER and APPRADIO are trademarks or registered trademarks of Pioneer Corporation. ANDROID is a registered trademark of Google Inc.
BLUETOOTH is a registered trademark of Bluetooth SIG, Inc.
iPhone, iPod, iPad are registered trademarks of Apple Inc.
© AppRadioWorld 2011-2015. All Rights Reserved. © AppRadioWorld 2011-2014. Powered by Blogger.